People complain about the weather this time of year, but, I actually like winter. Sure, it’s cold, and inclement weather can put a wrinkle in your plans. However, it is winter, it is supposed to be cold and, here in New England, it is supposed to snow. No surprises there. I strongly believe you shouldn’t complain about things completely out of your control, like the weather. On the positive side, there’s nothing like a bright, sunny winter day with the ground covered with snow, like today. I have a dog whose favorite thing in life is to walk. We walk outside for at least an hour everyday, no matter what the weather. She has a fur coat, but I bundle up (an excuse to exercise the variety of handmade hats and scarves I’ve made). We’re both quite comfortable. The recent snowfall has deterred us, but we often walk in nearby woods, enjoying the birds, trying to identify other critters’ footprints, and, generally, just enjoying being in the fresh air. Another positive thing about winter: homemade baked goods and hearty soups and stews all feel right this time of year. And most importantly, no excuse is needed to enjoy a mug of steaming hot chocolate. That said, I’ll be happy when spring arrives next month. I’ve already noticed it’s not quite so dark in the morning (at least until Daylight Savings Time starts), and it’s staying light later in the day. Another snowstorm is expected this weekend, so it’s definitely not over yet, but Winter is starting to get ready to hand things over to Spring. This week’s recipe for French Fridays with Dorie Cheating-On-Winter Pea Soup is a perfect warm up for the upcoming transition. 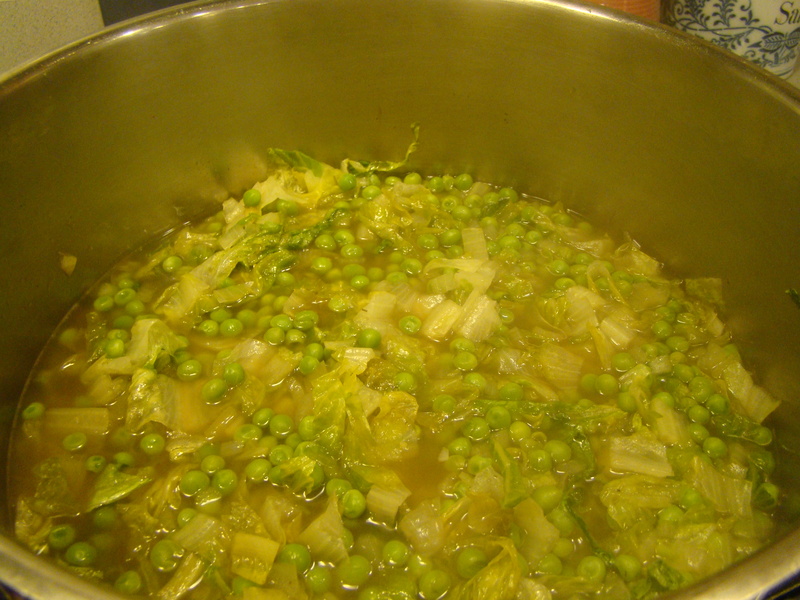 Dorie says this soup is a liquid version of a classic French salad of lettuce, peas, and onions. Certainly, this soup couldn’t have been easier to make. An onion is sautéed in butter. Liquid is added (I used homemade vegetable stock because I’d just made some, but you could use chicken broth or even just water). 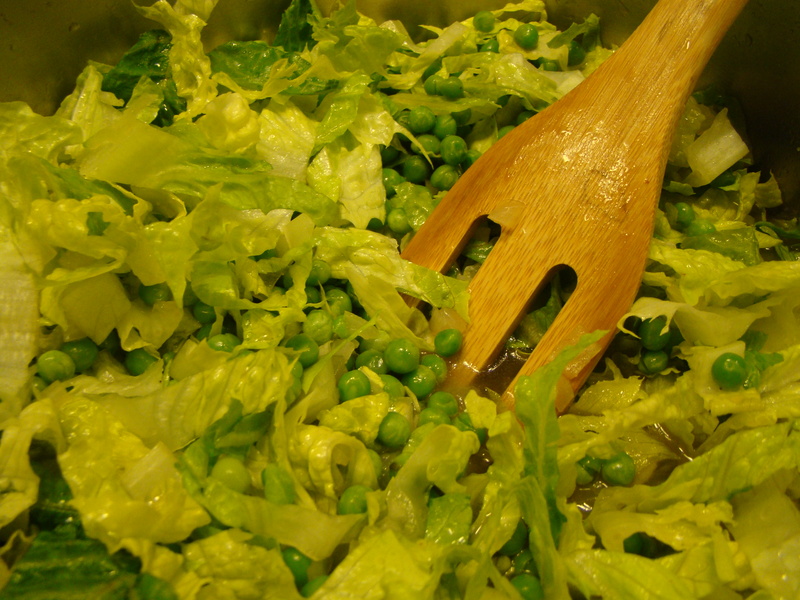 Then, frozen peas and sliced romaine lettuce are added and simmered before pureeing in the blender. Based on recommendations about this recipe from other Doristas, I used less liquid than the recipe called for (4 cups instead of the called for 6). This made a thicker soup, but otherwise, I think it would have been too thin for my taste. I pureed it in the blender because I find that makes the smoothest soup. Initially, I strained the first batch out of the blender, but too much body was caught in the strainer, so I added it all back in for a smooth, but not silky, soup. I found it was the lettuce that didn’t completely liquefy, rather than pea skins. The soup starts out a brilliant shade of verdant green, though it faded to a slightly more olive shade overnight in the refrigerator. This simple soup is fine as is, or you could dress it up a bit. Over the past month, I’ve been experimenting with making my own chèvre, so I topped my bowl with a scoop of fresh goat cheese along with some crumbled bacon. The cheese sank, so you can’t really see it in the picture, but it tasted good with the soup. The soup was a team effort. Howard cooked the bacon we used for garnish. This was the only recipe this month that got his seal of approval. Hooray! If you’d like to try this yourself (and I recommend you do), I found the recipe for a half-batch here on Epicurious. I’m happy to see that the lettuce amount in this version of the recipe is more precise. I mean, how big is a medium head of romaine anyway? Mine seemed rather large, but never having made this soup before, I wasn’t sure how to judge how much of it to use in the soup. The Epicurious recipe says 4 cups (for half a medium head), so I’ll make a note of that quantity in my book for next time. To see what other Doristas thought of this recipe, check out their posts here. Posted on 22 February 2013, in French Fridays with Dorie, Soup and tagged French Fridays with Dorie, peas, soup. Bookmark the permalink. 19 Comments. I really liked this soup too! I think your idea of only adding 4 cups of broth was a good idea, because it was a little on the thin side!! How exciting to make your own cheese! Your soup looks great. We enjoyed this one too. Fresh homemade goat cheese, I love that for this soup Betsy! I´m glad you liked it. Have a great weekend walking with your dog! I admit, I do love winter-related foods, even if winter has never been my favorite season. And I do love a good soup-weather day! I love the idea of throwing in a little goat cheese – a little tang would set off all the green flavor nicely. Well done with this one! Whining about the weather is a survival skill :-) The snow doesn’t bother me as much as the bitter cold & wind. However, it is baking season – which I can totally get behind. I like that you were able to use your cheese with this one :-) Go, Betsy! You and I could have been standing together in the kitchen. I didn’t read the P&Q’s. Okay, Betsy, I KNOW I put up the Link but just didn’t have time to read the comments. My Bad. I put all the 6 cups of liquid in the soup, as specified, and it was too much. Then I strained it, as you did, and I tossed most of the flavor down the drain. (Didn’t rescue it like you did.) Therefore, although I liked this soup, I needed more flavor and won’t toss the “bulk” next time. My romaine head was huge so I have no idea about whether that was right or wrong. Paula suggests using arugula and I think that’s a great idea. Garlic, also. On the other hand, if Howard likes it, don’t mess with it. I am not complaining about the weather at all, even though I’ve had some cold weeks as I’ve gone back and forth to Colorado. I am reserving my whining and complaining for next Winter when I’m living full-time in that frigid mountain weather. I’ll personally whine to you, okay? I’m jealous you made chevre! I made the recipe from the Bon Appetit link since i left my book at work that day. The proportions there were just fine for me so I guess I dodged a bullet there. Even though I’m in Florida for a couple weeks, I too, love winter! I love sitting by my fire place, while the snow is falling…and feeling so warm and toasty! Baking and winter just go together!! I’m so impressed that you made your own cheese! You are such a renaissance women! First bees and now cheese!! Loved this soup…it was quite good, and yours looks delicious! I will definitely make this one again! Hopefully without the drama of the soup exploding all over the place…it was very comical! Have a great weekend, Betsy! Your soup looks delicious. I love soup in the winter. Have a great weekend. I grew up in New England and I love winter. The brisk air and the silence of a walk in the snow. Next to Fall it is my favorite time of the year and yes, the food is part of it. I get really tired of light salads and grilling in the summer… call me strange. But I much prefer a dutch oven stew. I need to get over my fear and make cheese… I really want to do it. Wonderful that you did. This simple soup really had a lot of complex issues… but I think it helped us all grew as cooks. Your walks with Bella sound so lovely, Betsy. Your soup looks lovely and I bet was delicious with your homemade chevre! I hope you don’t get too much snow this weekend and can still get out for your walks. Have a great one! 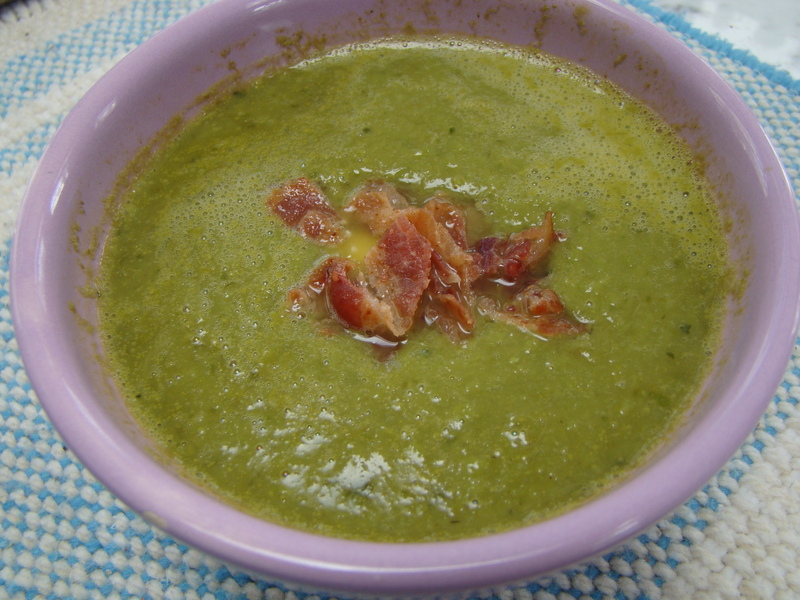 Betsy, a pretty bowl of delicious green Pea Soup together with bits aof bacon and homemade chèvre – what more could one ask for?! It looks delicious! And as I am writing this, it has started to snow outside. Have a wonderful weekend with not too much snow and a great walk outside! I love your phrase about winter handing things over to spring and I can relate to long walks with the dog, too. Mine loves to explore the city with me and I try to take her on 5-10 km walks three to five times a week. It’s fun heading off in a different direction each walk and seeing what we can discover in the neighbourhoods we find ourselves in. Bacon and homemade chèvre sound perfect for dressing up this simple soup. I’m glad it was a hit for both of you! Homemade chevre sound PERFECT for this soup! Yup, I need to read the P&Q’s before making…I had to prop up my creme fraiche on a piece of prosciutto :) Hope you’re having an excellent weekend! I’m a New Englander myself and I love real winter. By which I mean a winter with snow. I’ve had trouble adjusting to Frankfurt winter which, more often than not, means temps which hover just above freezing and lots of cold rainy days. Great team effort. Your soup looks delicious! I am not a pea fan at all and was borderline shocked that I liked this soup. Which is great since I made Dorie’s and Ina’s :) Apologize for the late comment- I had too much fun running around seeing the Barefoot Contessa and cooking and ended up with a miserable cold (but it was worth it). Glad I had so much soup to enjoy ~ Though I wish I had some of your homemade chevre. Sounds fabulous.PS- love winter as well. Wish I was up in Vermont right now but most folks around here make faces when I say that and want to head to Florida. Not this gal……..